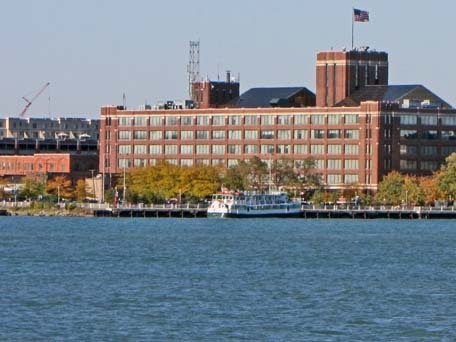 The impressive building facing the Detroit River that you see pictured above, was the first major structure erected by a pharmaceutical firm in the United States for the purpose of conducting research. Detroit physician and pharmacist ,Samuel P. Duffield, formed a partnership with Hervey Coke Parke to manufacture pharmaceuticals in 1866. The next year George S. Davis became the third partner. Five years later, the partners incorporated their firm using the name Parke, Davis and Company. The modern pharmecutical industry emerged in the United States in the years after the Civil War. Prior to that, most states did not license doctors, so many individuals became physicians by serving an apprenticeship. Quite a few of those physicians concocted remedies and sold them. The modern field of scientific pharmacology emerged although many patent medicines and home remedies were sold and continue to be marketed. Detroit became the national center for the development of the modern pharmecutical industry. Parke-Davis was one of the city’s leading firms. I believe that Stearns was another. The Stearns building stands nearby on East Jefferson and has been successfully converted into a residential property. I do not know of any book that seeks to explain why Detroit became such a center for the modern pharmecutical business. It is easier to explain why Detroit became such an important tobacco manufacturing center by 1890. As their business increased, Parke Davis purchased a desirable location on the Detroit River that had been occupied by the Detroit Boat Club. That organization moved to Belle Isle where their underutilized building still stands and now awaits renovation. This site had access to both rail and boat transportation. Between 1891 and 1946, Parke-Davis constructed 26 building on this campus, most of them substantial red brick structures with an academic mien. 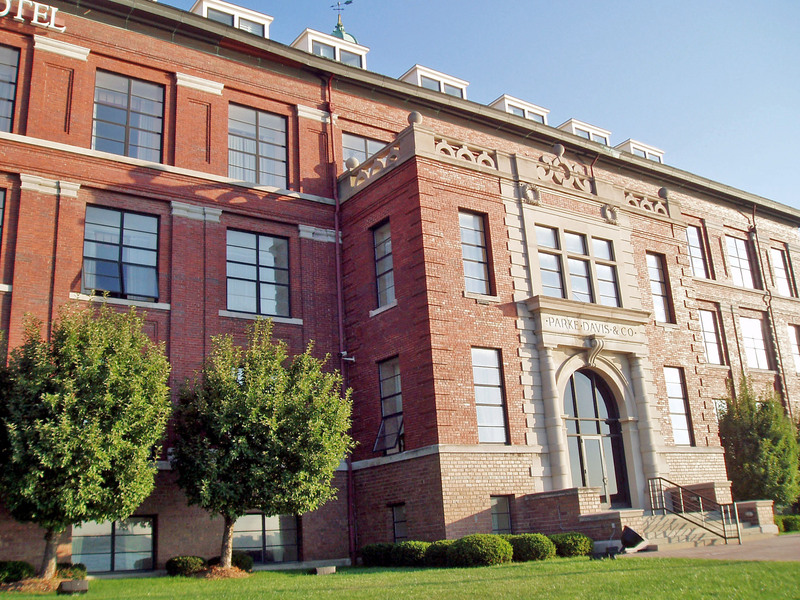 The Research Laboratory was originally known as Parke-Davis Building #55 and constructed in 1902. It is a richly decorated three-story brick structure about 120 feet in length along the river and forty feet wide. It is certainly a building of its era. Note the impressive doorway with its arch and the numerous embellishments on the side that faces the Detroit River. Of course, at this time, there was no conception of what a research laboratory should resemble. This is, I believe, the eighth building in the city of Detroit to be designated a National Historic Landmark. The others are the Ford plant on Piquette, the Fisher Building, the Fox Theater Building and the General Motors or Durant Building in the New Center area, the Guardian Bank Building, the Lincoln Motors Building on West Warren where engines were designed and built for World War I airplanes and the Pewabic Pottery Building on East Jefferson. Detroit Edison, owner of the Lincoln Plant, razed most of that building in 2004 so it was delisted as a National Historic Landmark on April 4, 2005. I believe that there is some possibility that the building you see pictured here may be delisted since it was renovated. Parke-Davis was purchased by Warner-Lambert in 1970 and they began to move many of their operations to a facility in Ann Arbor. That firm was purchased by Pfizer in 2000, a company that subsequently closed their Ann Arbor campus. After Parke-Davis left Detroit, the Stroh’s Real Estate firm purchased this riverfront property and converted many of the buildings into condominiums, restaurants, a health club, office space and the Omni Hotel. Some of the renovations to the Research Building may not have preserved the historical integrity of the structure leading to possible questions about its continued status as a National Historic Landmark. The Omni chain gave up their lease to operate this very attractive hotel in October, 2010 as Detroit's hotel business became more competitive with the opening of new casino hotels. In the summer of 2011, this lovely building was reopened as The Roberts Riverwalk Hotel and Residence. and listed on September 15, 1985.